On 1 March the speaker was the chair of the Pembrokeshire Historical Society, Dr Simon Hancock FSA who spoke on The Pembroke Mint. This was a change to the advertised talk. Simon Hancock set the scene with a review of the Norman incursions into south west Wales after the death of Rhys ap Tewdwr in 1093 and the founding of Pembroke Castle by Arnulf de Montgomery. In 1102 the Lordship of Pembroke was taken into Royal hands by Henry I (1100-35) and this, coupled with the encouragement of Flemish migration saw considerable economic advances for the Borough of Pembroke. In 1130 the sheriff of Pembroke named Hait, perhaps a Fleming, listed a return of some £60 into the Exchequer. There was only one denomination at the time so all would have been paid in silver pennies, over 14,000 worth. Around that time a mint was opened at Pembroke with a moneyer named Gillopatric, perhaps an Irishman. He struck some of the later issues of Henry I . The mint signature is rendered as PAIN or PAN. All Pembroke issues are exceedingly rare. From the Pipe Roll there is reference to Gillepatric paying the sum of £2 although he still owed a further £2. Nothing more is known of this enigmatic moneyer. He also struck for King Stephen and very recently a unique Pembroke penny struck for Matilda was unearthed. This reflects the changing political fortunes of The Anarchy which followed the death of Henry I. Later a second Pembroke moneyer, Walthier or Walter is known. His were part of the so-called ‘Tealby’ coinage. It is thought the Pembroke mint closed in the very early 1160s never to reopen. These wafer thin pieces of silver are a very tangible link with the young borough of Pembroke of the twelfth century. As recent events over the past two years demonstrate our knowledge is far from complete. The discovery of new and occasionally hitherto unrecorded specimens means we will always need to revise our understanding of the chronology of events. 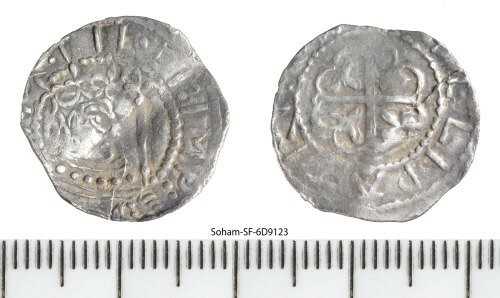 A unique silver penny of Matilda struck at Pembroke by Gillepatric (or Gillopatric) image courtesy of Time Life Auctions.